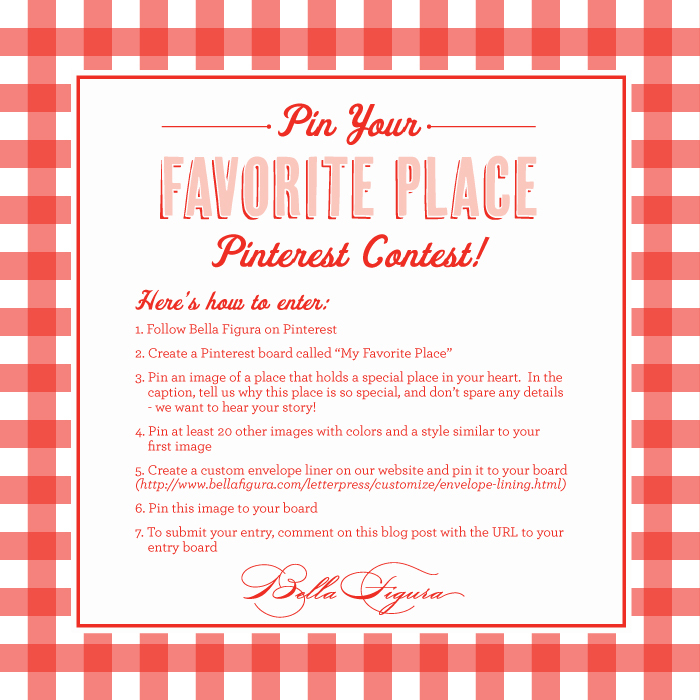 Bella Figura: Pin Your Favorite Place Pinterest Contest! For all of you Pinterest fans out there – this contest is for you! 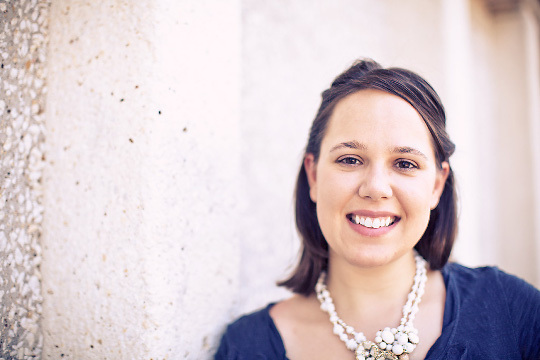 Our lead designer Jessica Tierney will be judging the contest and creating an invitation suite based on the winning board. Judging will begin on July 23, and the winner will be announced on July 27. The new Pinterest-inspired design will be released with the new collection in January 2013. Entry deadline: The contest runs from July 16, 2012 through 12pm EST on July 23, 2012. To enter, follow the instructions above and submit the URL of your Pinterest board to the comments section below. The grand prize: The person with the winning board will receive 100 free letterpress party invitations printed on our A6 sized cards in two inks on our 1-ply cotton paper with 1-color letterpress printed envelopes. 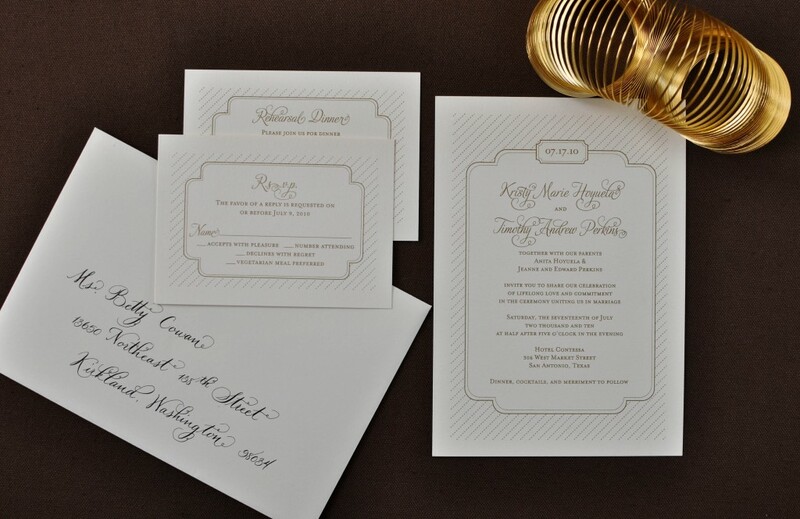 Choose from any of our 300+ invitation designs and create the perfect piece for your next event! Be sure to take a look at our Social Album for inspiration. 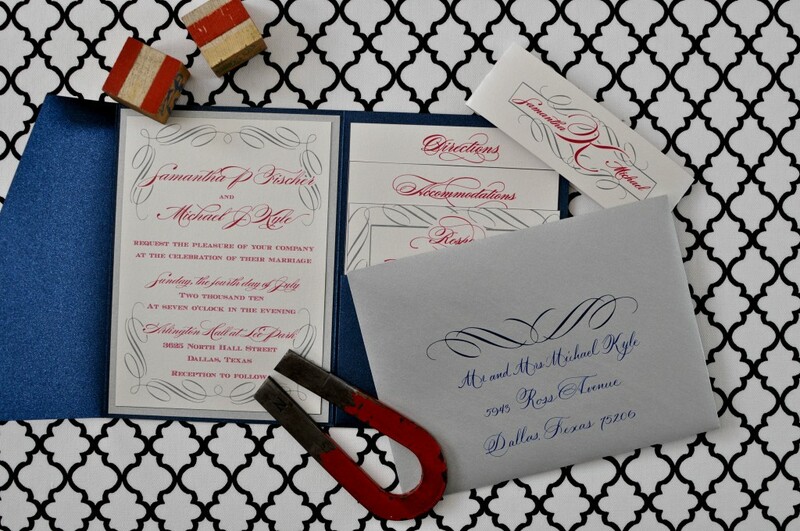 *The fine print: additional invitations, custom design fees, additional ink colors, double-sided printing, added embellishments or rush orders will incur charges. Need an invitation to join Pinterest? Email hello@bellafigura.com and we’ll send you one right away! We can’t wait to see your entries — good luck! Wow – 2 years ago this couple tied the knot! Congratulations! I am sort of in love with this Betsy White invitation. The gold dotted stripes make me happy. 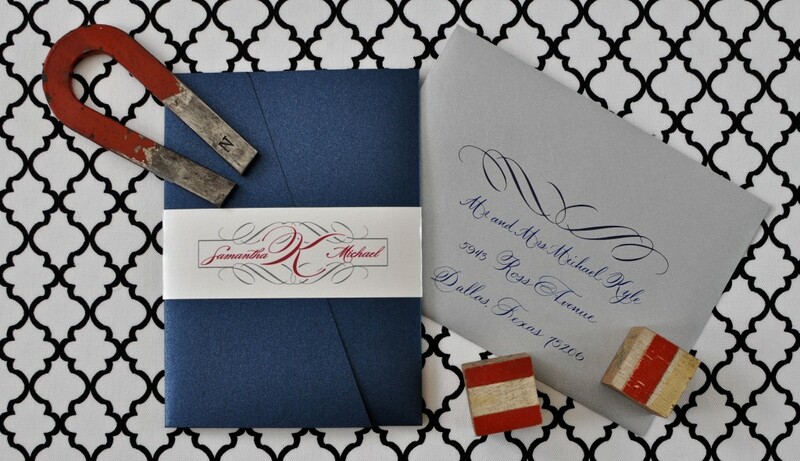 The bride already picked out the invitations and in our consultation asked if it was possible to match the lettering. This is something I do quite often for brides – it never hurts to ask! A few years back I got to work on some pretty patriotic invitations for a fourth of July wedding. Since we just passed the holiday and their 2 year anniversary, I thought I would share some images. I really was pleased with the way the addressing turned out with the very bold ornament printed on the envelope. It did need to be centered for the pretty factor. We matched the font (which I now offer as a regular – look for it soon on the website) and used a nice blue ink color. I love the little belly band they used with this invitation, it works really well.